... is a window system. ... is a lean Grahpical User Interface (GUI). ... is a shared library..
... is made for Linux and macOS. --- offers one C sourcecode for two systems. GeeonxDemo running on Ubuntu Linux. GeeonxCreator running on Xubuntu Linux. GeeonxDemo running on Mac OS X Snow Leopard. Get a first introduction and install information for Linux. Get a first introduction and install information for macOS. Get a quick guide to Geeonx programming and Geeonx Creator. September 2018 - Geeonx for macOS/SDL2 is ready for download. September 2018 - Geeonx for Linux/SDL 2 is ready for download. Geeonx draws and updates all GUI-elements like windows, pulldown-menus, icons, inputforms and buttons of your application that you have created before with the tool GeeonxCreator. 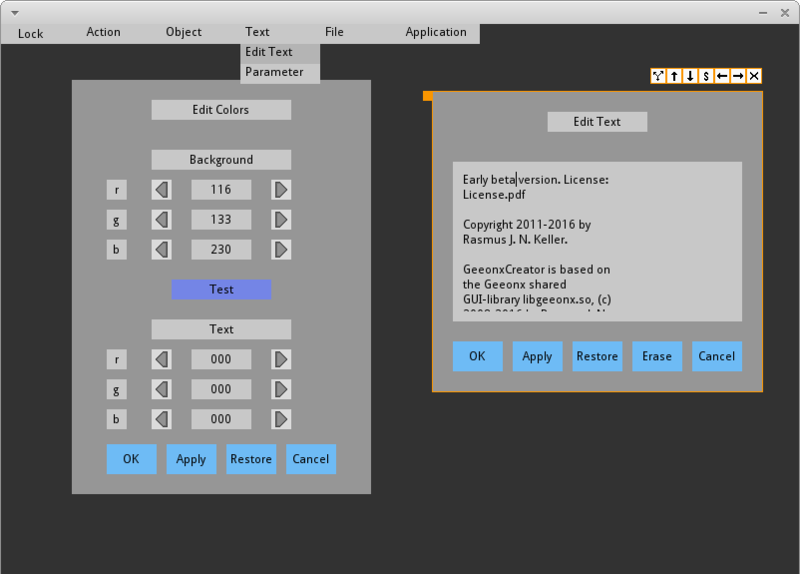 With the tool GeeonxCreator you are able to design all GUI-elements of your application. Geeonx stores the data of each and every GUI element in a corresponding Geeonx object. GeeonxCreator stores the GUI data into a *.gee and *.gew file. 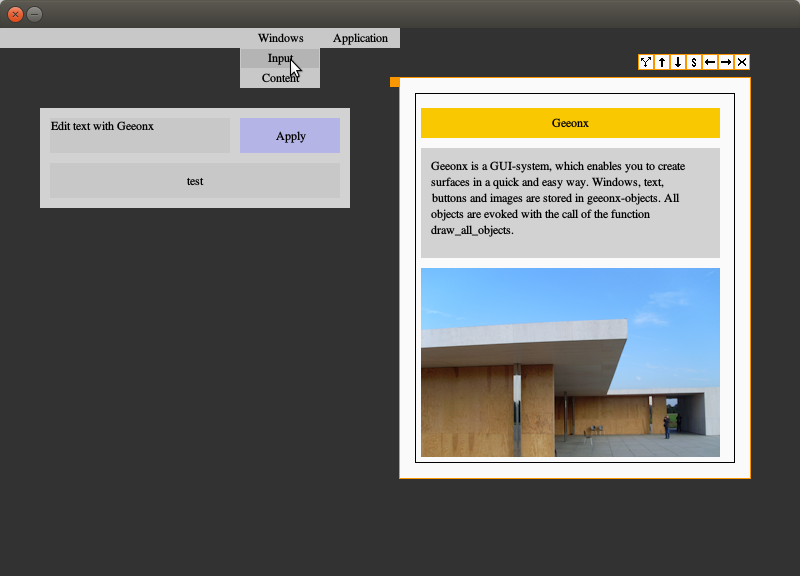 The Geeonx shared library will take over all drawings of GUI elements inclusive window content. The library will also handle all window, button or input events. For example with Geeonx your are able to create forms for the input of text by the user. Hence it is very easy to program applications with windows, buttons and icons. For example to alter the content of a window you just change the text_string linked with the structure of the Geeonx_object. 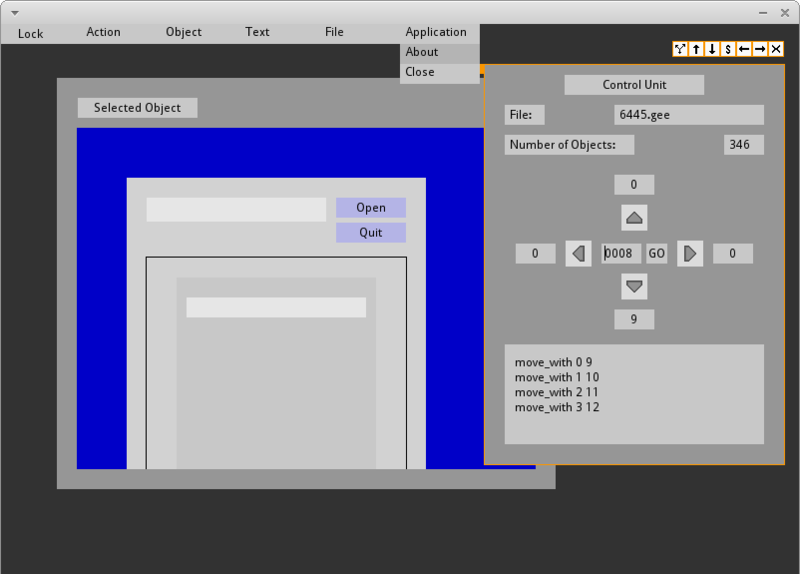 With the call of the function gee_draw_all_objects() the whole interface of the application will be updated. The Geeonx library is written in C programming language and offers an API for the use with C/C++. You can create GUI applications for Linux and macOS with an identical sourcecode. For Mac-users geeonx offers the opportunity to do GUI programming in gcc-style. With the Geeonx shared library and GeeonxCreator the interface of your application is created fast and easily. You can concentrate yourself on the features of your program and let Geeonx manage the GUI. Therefore Geeonx is suited to decrease the development time of you desktop or embedded applications. A computer with a x86-cpu with a LINUX operating system or macOS. Furthermore the shared libraries SDL 2, SDL_ttf 2, SDL_image 2 are needed.